Portrait of the artist. 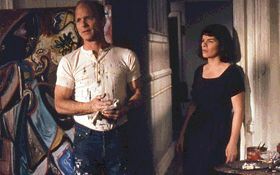 Pollock at home with the missus (Harris and Harden). For some reason, it took 18 months and a best supporting actress Oscar before this film got a UK release. This is a sensitively made film that gives honest insight into the mind of one of this century's most celebrated painters, even if it falls into some movie-bio traps. The film follows Jackson Pollock for (Harris) 15 years, from obscure cubist to revolutionary artist. It finds its heart in his relationship with a fellow painter Lee Krasner (Harden) and their tumultuous marriage, as they cope with the New York art circles, the stresses of daily life as poor artists, and Pollock's alcoholism. The film's only misstep is to rely so heavily on the bad drunk/tortured artist/troubled marriage stuff we've seen in so many other biopics. Not that this isn't a realistic pattern for artistic genius, but it's overused and simplified in the movies as if it explains everything. That said, Harris' directoral debut shows huge promise. He directs like he acts--quiet, straightforward, slow burning. He reveals intimate details with clever camera work, gradually building the dramatic intensity, subtly grabbing us both emotionally and intellectually. There's a freshness everywhere--script, performances, direction--that makes this film something quite special. Harden deserved the Oscar for this--she's edgy and fascinating (and much more than a supporting character), while Harris gives another of his internal, piercing performances as a self-destructive man who effortlessly stands the art world on its head. And in the fine supporting cast, Madigan is the standout as the brash, lively Peggy Guggenheim. This is a creative, artistic film examining the nature of creation and art. It doesn't say anything terribly new about art, but it's a superb portrait of the artist himself.